Window SharePoint Service (WSS) 3.0 and Microsoft Office SharePoint Server (MOSS) 2007 both provide a platform for communication, collaborative development, content management, search capability etc. But how do they differ from each other, what benefits do each of them provide over other, in which scenario to use WSS and in which to use MOSS? Gone are days when file based sharing approach was a way of collaborative development. Even though this approach had been in use for long time but it had several of its inherent problems and limitations. Microsoft offers solutions for all these problems/limitations and even much more with "SharePoint Products and Technologies" which has two products viz. Windows SharePoint Service 3.0 and SharePoint Server 2007 in its arsenal. Both of these products provide a power platform for communication, collaborative development, content management, powerful and enhanced search and helps people in staying connected across divisional, organizational and geographic boundaries. Both of these products are based on .NET framework for development and SQL Server as back-end to store content and configuration data. Windows SharePoint Service (WSS) 3.0 is an add-on service which you can install on Windows Server 2003 or Windows Server 2008 which conforms to Windows Server licensing model. So there is no upfront investment required for WSS 3.0, even the installation and configuration is quite easy and hence very little or no assistance would be required from IT department. Microsoft Office SharePoint Server (MOSS) 2007 is an application which runs on the WSS 3.0 platform and extend the collaborative development foundation of WSS 3.0 to a new level i.e. MOSS 2007 is superset of WSS 3.0. In other words, MOSS 2007 is enterprise collaboration and portal application which sits on top of WSS 3.0 framework and extends WSS 3.0 features/capabilities as well as provides several new features which are not available in core WSS 3.0, for example Enterprise Search, the Business Data Catalog, Forms management or Personalization, Excel services, Document workflow and many more. MOSS comes in two editions viz. Standard and Enterprise and features varies between these editions. You can get the detail features list here. The relationship between Windows SharePoint Service 3.0 and Microsoft Office SharePoint 2007 as well as other related technologies and development tool has been beautifully presented in the below logical architecture diagram. 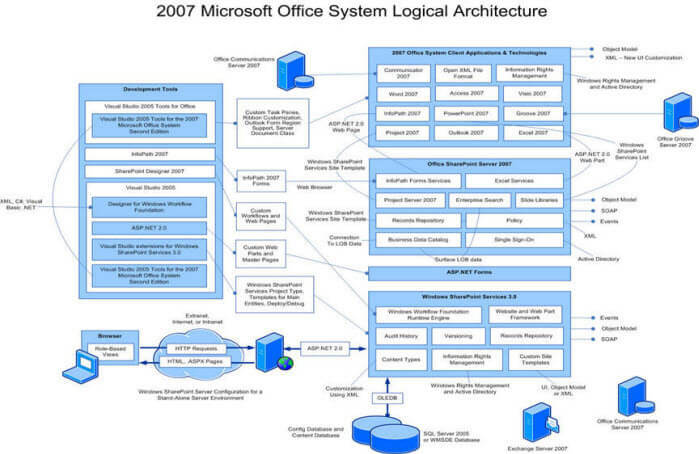 You can download visio/xps version of this architecture diagram from Microsoft Download Center site. WSS 3.0 provides the core framework for collaborative development, document/content management and search capability whereas MOSS is a portal application which sits on top of this collaborative framework to extend and provide additional features which are not available in core WSS 3.0 framework. For example Enterprise Search which allows searching across websites and site collections, the Business Data Catalog, Forms management or Personalization, Excel services, Document workflow and many more. In other words, MOSS 2007 is superset of WSS 3.0. There is no need of software licensing for WSS 3.0 as this is an add-on of Windows Server operating system whereas you need to have license for MOSS 2007 which comes in standard and enterprise edition, so in nutshell MOSS 2007 requires minimum of upfront investment for software and in some cases for hardware too where you want have a web farm to balance the increasing load of your site and SQL cluster to make it highly available. WSS 3.0 is ideal for small or mid size company which has requirement for core features and does not have budget for additional licensing. MOSS 2007 is ideal for mid or large scale enterprises as it provides additional features and extended enterprise search capability of searching searching across websites and site collections. To help you decide which SharePoint technology is right for you, Microsoft office online has detailed and compared features of each of this applications, for details click here. To download the same information in Excel, click here. Review "Which SharePoint technology is right for you?" page on Microsoft Office online site. Review Guide to SharePoint Server Features article on msdn. Installing SharePoint Foundation 2010 on a Single Server - Part 1 tip.